Solutions 2 GO, Koch Media and Planet Entertainment have announced that Bass Pro Shops: The Strike – Championship Edition will release on Nintendo Switch, and, with it, the first fishing rod peripheral for the portable home console. The fishing controller promises to finally offer “true interaction” in the fishing simulator, that will take you to North America’s greatest lakes where you will have the chance to catch 11 types of fish. Whether you’re looking to reel in the Largemouth, Smallmouth, Catfish, Striped Bass, Northern Pike or Muskie, there are three different game modes in Quick Fish, Career and the Bass Pro Shops Invitational Tournament. Career Mode will specifically challenge you to understand your equipment, lake bottom topography and how the fish behave in order to succeed. And, as a quick distraction, you can compete with friends and family in the Boat Racing and Casting Challenge minigames. As for the fishing controller, well, you will need to squint to see it on the box artwork. With both Joy-Con placed inside the contraption, you will hold the ZL Button and pull back on the rod (left Joy-Con) to cast out. Then, once you’ve caught a bite, you will need wind the reel (right Joy-Con) to furiously work hard to wind in your catch. 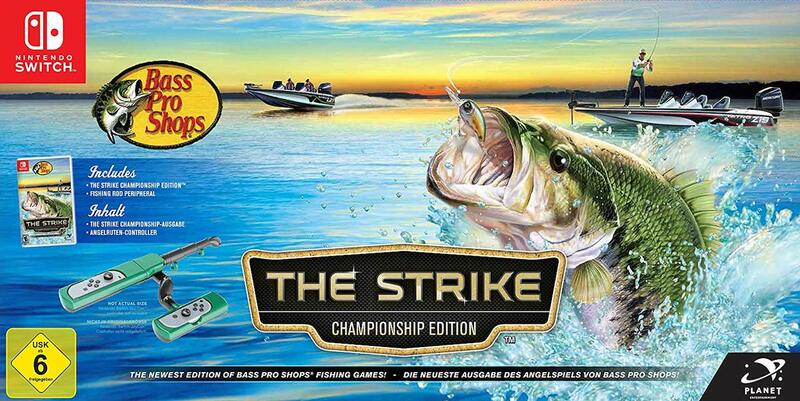 Bass Pro Shops: The Strike – Championship Edition will release for Nintendo Switch worldwide in 2018.